19" x 25" or 20" x 29"
These can be used on any item! 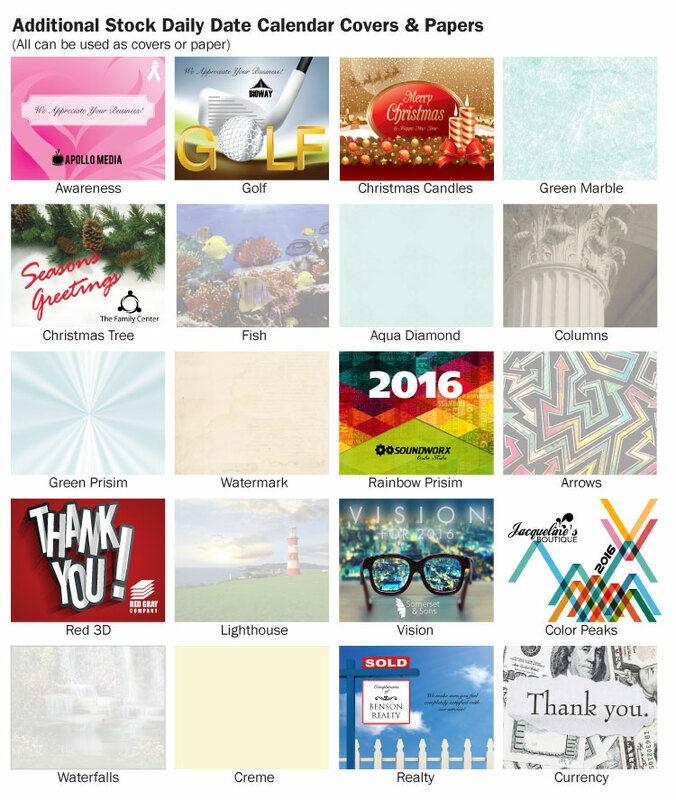 Daily Impressions can provide logo exposure on a daily basis by providing a number of standard calendar themes which will motivate, educate, inspire or positively impact the reader. Four Steps to Make Your Calendar Unique! Step 1: Choose your Cover! This is the first page of the calendar— a full color cover, printed with your logo and information in black. 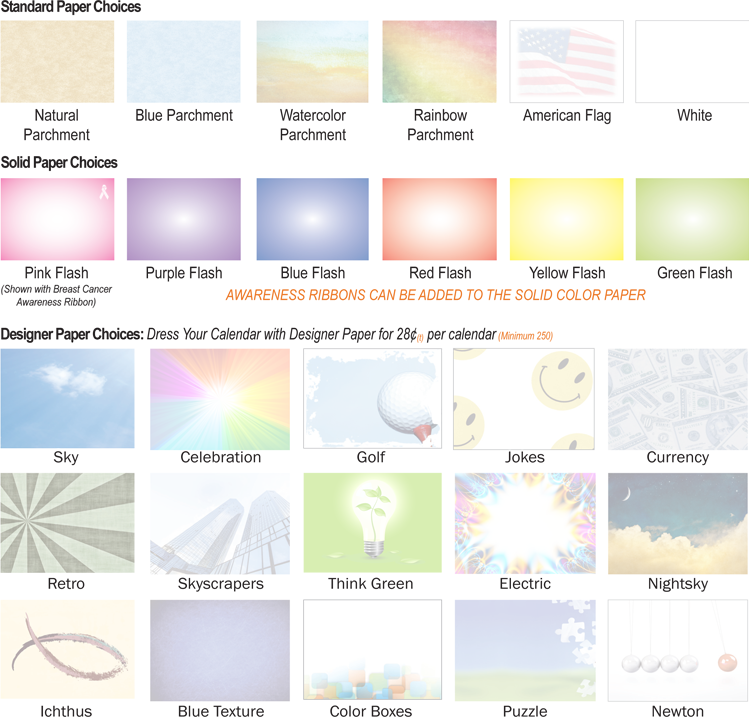 Step 2: Choose your Calendar Background Paper! This is the paper your daily calendar pages will be printed on. Step 3: Choose your Date Format! Select how you want your calendar to be laid out on your calendar pages. Step 4: Choose your Calendar Theme! Choose to print different jokes, tips, quotes, and more on each day. To top things off, all Daily Impressions calendars come with a free stock cover! The covers are designed to let your customers know just how important they are to you. Unless indicated, all covers feature an area for your imprint in black ink. Covers can also be printed on background paper. The entire page is available for your black imprint. Stock covers are available for all calendar designs . OR YOU MAY CHOOSE A CUSTOM COVER! Daily Impressions has the capability to produce four-color process, screens and photos, full bleeds and more! 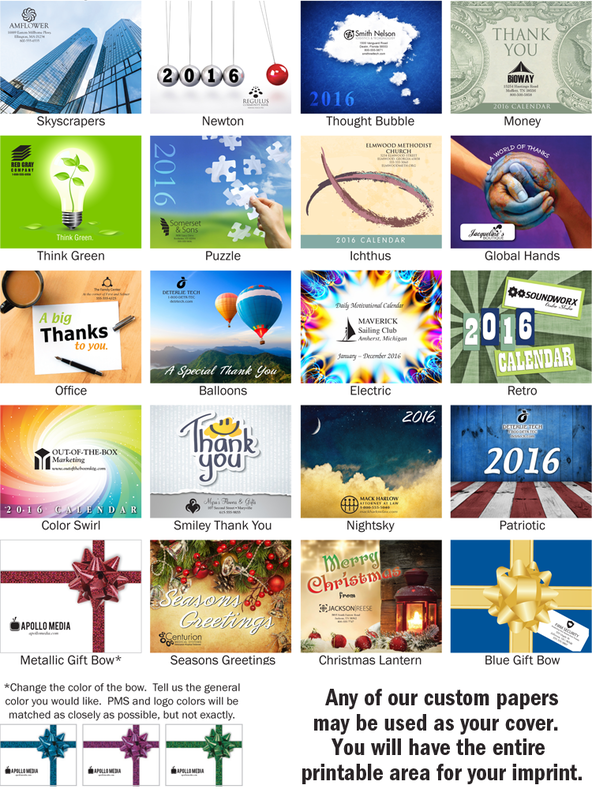 Design your own custom cover for only a small additional fee of $0.14(t) per calendar. Or, use one of our in-house designers at an additional hourly cost to get the look you’re after. Calendars are padded and adhered to a black polypropylene stand. Combines Saturdays/Sundays for a total page count of 313. Customer logo imprint on every page and 25 changing tag lines (if provided). Choice of standard full color cover options or custom cover with your art provided. FINAL SIZE: 6.125" x 5.125"
PAPER SIZE: 5.3125" x 4.25"
APPROX. WEIGHT PER 100: 95 lb. IMPRINT AREA: 3" x .875"
Daily Impressions offers a choice of several background paper options to enhance the look of your calendar. With so many designs, it’s easier than ever to match your content to our theme papers to create a truly original product. Any of these background options can be used as a cover design. If you choose a background design as your cover, the entire cover page is available for your black imprint. Want your own 4-Color Custom Background? Order now for only 28¢(t) per calendar plus $350 setup! These are our standard calendar themes - the center text changes daily. Get Creative! Make a Custom Daily Date Calendar Theme! All of our calendar formats can be tailored to accept your own content. There is no run charge per calendar, only a setup fee. Simply submit your content in a PC text file and we will do the rest. Messages can include sales tips, satisfied customers' quotes, employee statements, academic facts, safety tips, product information, etc...the possibilities are endless! This feature requires a minimum order of 250 calendars. Submit your custom theme with 313 of your personal messages in the order you want them to appear in your calendar for a $350.00(t) set up charge. Our front cover designs were developed to give a polished look to the standard shrink-wrapped calendar. For those times when a more formal presentation is required, we have either a full-color gift box or a plain white gift box. how many — we’ll take care of the rest! All calendars come with a sturdy black polypropylene stand. The calendar will lie flat on any surface, or you may pull out the attached hinge on the back, and the calendar will sit at a convenient angle for easy viewing. The stands are recyclable. Daily Impressions offers complete mailing and drop shipment services, offering you savings on delivery time and shipping charges, as well as saving you the hassle and expense associated with fulfillment houses. Two mailing options are available: Priority Mail and Media Mail. We supply the mailing carton or corrugated mailer, apply your label, insert an optional letter or card (4” x 6” max. size), and mail the calendar. Postage is charged at actual cost. Postage rates subject to change. Drop shipments in quantities of 50 or more pieces are free. There is an additional charge per location for drop shipments with less than 50 pieces. Copyright 2014 - DailyImpressions.com - All Rights Reserved.